As we turn the calendar, pack up the decorations and sweep up the pine needles, this time of year has signaled a period of productive downsizing in our home. It’s the meeting of many needs — to make space, figuratively and literally, for the new baby; to get a handle on the constant flow of stuff; and to start the new year with a fresh sense of purpose and place. It’s also a great way to prepare the environment, not just for Jasper, but for the whole family. I’m guilty of presenting perfectly tidied shelves for Jasper, while “behind the scenes,” my materials cupboard can get to be such a jumble that I’m afraid to open it too quickly. One of the major differences between a Montessori classroom and a Montessori home is that in the home, many people of many ages and interests may live there. We’ve all got stuff, and we all need to feel at home. How do we balance that with Jasper’s developmental needs? It’s an ongoing process. One of the things that I really appreciated from my Montessori training this summer was one of the teachers’ emphasis on the use of non-toxic and environmentally-friendly cleaning products made from essential oils. She saw this as a natural part of the prepared environment: one which is safe and welcoming to children — chemically, as well as physically. 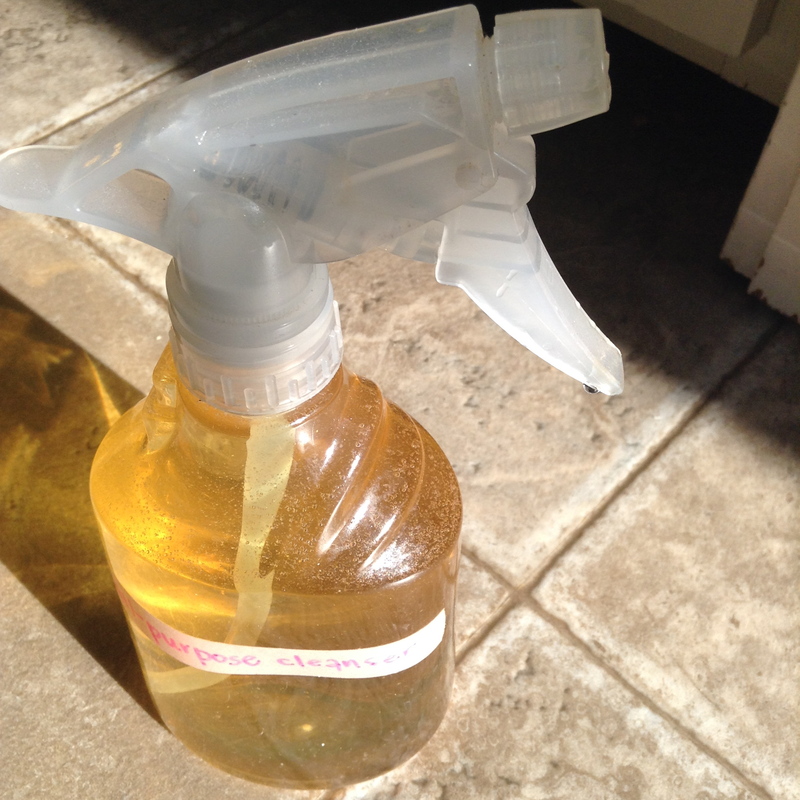 It’s in that spirit that I’m sharing this recipe for a great, people- and pet-friendly DIY all-purpose cleaner. It’s based on vinegar, which is an effective disinfectant against salmonella, E.coli and “gram negative” bacteria — a great tool in the kitchen or bathroom. 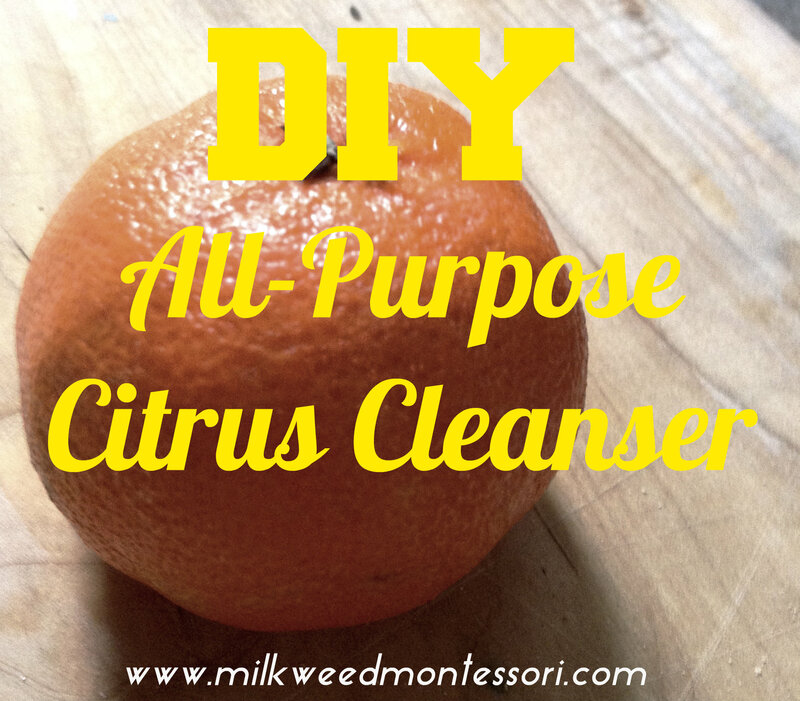 My favourite use is while wiping out a potty, where a sensitive bum might If you’re hesitant about the smell of vinegar, rest assured the odors evaporate quickly and this cleanser adds a sweeter citrus note into the mix. 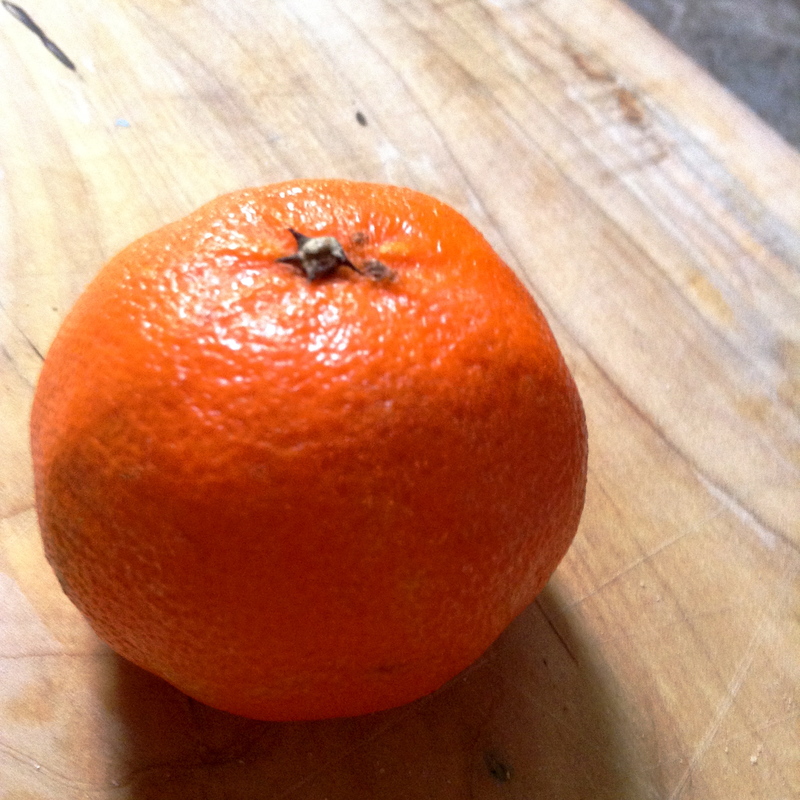 It also makes use of all those clementine peels this time of year! 1. Peel clementines, lemons, or whatever other citrus you’re using at this, the peak of citrus season (in the Northern Hemisphere). Keep peels in a mason jar. 2. 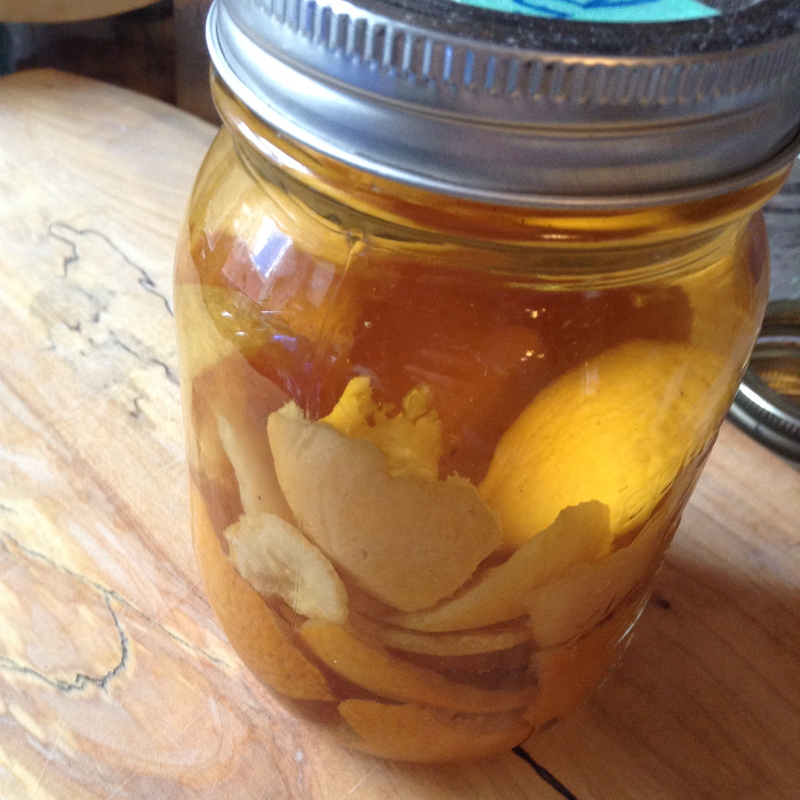 When the mason jar is full of peels, pour white vinegar over, to cover them. Put on a lid on the mason jar. Leave it alone or shake it occassionally. Whichever suits you best. You really can’t mess this up. 3. 2 or more weeks later, strain out the peels, funnel the citrus-powered vinegar into a spray bottle and fill to the top with water. Shake it up. Spritz it on. PS. This cleanser is also great because it’s safe for child-led cleaning — just this morning, a ride-on toy was getting “detailed” with this kid-friendly spray. Thanks for the recipe Meghan. We are always on the hunt for new natural cleaning ideas. I will have to put this in a little spray bottle and add it to Quentin’s clean station. I love this post. SO helpful. I just started using vinegar to clean, but didn’t really have any recipes for specific uses. I really like the fact your recipe is easy and it has citruses. Thank you for sharing!